An Israeli man from Jerusalem was indicted Thursday for making contact with Iranian officials and offering to betray his country. The man, 47, is a member of the extremist anti-Israeli sect Neturei Karta. The sect has been repudiated by the vast majority of Jewish leaders, including those in the hareidi-religious community. 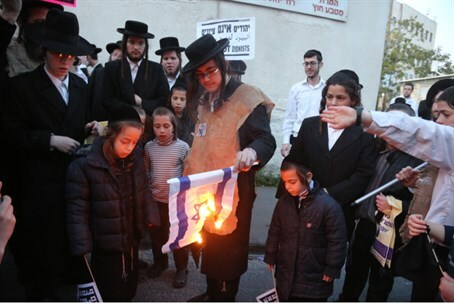 Members of the small splinter sect receive significant media attention due to their frequent meetings with Arab leaders and participating in anti-Israeli rallies, all while wearing traditional hareidi Jewish garb. According to the indictment, the man took the initiative to spy on Israel, without having been contacted by enemy agents. He looked online to find out where Iran has embassies. He explained to the Iranians that he is an Israeli citizen who believes the state of Israel should not exist, and that he wishes to see Israel governed by non-Jews. He offered to gather information and pass it on to them. During the conversation, the man asked the Iranians why they were unable to protect their people from assassination by Israel within Iran. One of the Iranian men asked him why he was mocking them, while he sought refuge in Iran. The Iranians ended the conversation by telling the Neturei Karta man that they needed to discuss the matter with their superiors. “Hajj Baba” gave the man an email address and password, and told him to enter the email account to see their response. He also told the man to stay in touch using the embassy’s phone number. On January 20, 2011 the man returned to Israel. He checked the email account he had been given several times, using a computer at an internet café in Jerusalem. He also called the Iranian embassy in Berlin twice, each time from a public phone. On one occasion embassy officials did not answer. On the other, the man asked to speak to “Hajj Baba” and was told he was not present that day. The suspect was questioned by the Israel Police’s Lahav 443 unit.